On Sunday, September 27th, LEGO entered the toys-to-life genre with the release of LEGO Dimensions on the Wii U, Xbox 360, Xbox 1, PS3, and PS4. For anyone unfamiliar with the genre (populated so far by Skylanders and Disney Infinity), it is a mix of video game and physical toys. A peripheral device is typically plugged into your console and, using NFC technology, reads a chip inside the toys as they are placed on the device. The game works by loading whichever characters are on the peripheral device and displaying them as playable characters. That was perhaps the most boring description of what turns out to be a very clever business model and a very engaging video game experience. With LEGO Dimensions you have to purchase the base set at $99. 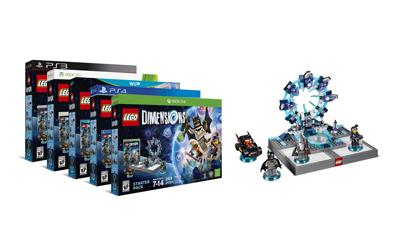 It comes with the game, the peripheral device (in this instance called the Portal), three Characters (Batman, Gandalf, and WyldStyle from The LEGO Movie), one vehicle (The Batmobile), and several hundred LEGO bricks. You build the Minifigs and place them on their respective bases which are read by the portal and let you play with those characters in the game. Each character has its own special abilities and allow access to different parts of each level or open other worlds for you to explore. Other than actually being able to use the LEGO figures and pieces in your own designs and creations, the second big difference between this game and its competitors is the interactivity with the portal. The device itself has three different sections, a central platform and two side areas. During the game, some villains or puzzles will cause these areas to light up and make you physically pick up the characters and move them to get them out of danger or to solve some of the environmental puzzles. The main story takes approximately 10-12 hours to complete and lets you jump from world to world based on the various licenses that LEGO and TT Games have acquired. One minute you're fighting the Wicked Witch in Oz and the next you're the Doctor holding off the Dalek and Cyberman forces, all while trying to stop the main villain of the game, the Gary Oldman-voiced Lord Vortech. Even after you've beaten the main game, there are tons of collectibles to run around and find, worlds to help rebuild after all the destruction, and secrets hidden in every corner. That's all just the main game. Then there are more packs of LEGO figures you can buy that add new characters, new abilities, new vehicles, and all new levels to explore. The only downside to all of this is that if you want to experience every area and unlock every nook and cranny of the game, you will need to buy more packs. As far as I can tell, you don't need all of the packs, which, along with the starter, would cost north of $600, but you're still looking at right around $300. And that's just in this first wave of content. Considering the fact that I'm the one who bought a $300 LEGO Helicarrier that sits on my desk collecting dust and looking oh-so-pretty, I feel like I'm getting more than my money's worth with LEGO Dimensions.